Froyle, which consists of the two villages of Upper & Lower Froyle, is situated in the North-East corner of Hampshire, some 50 miles from London. It is 1 mile to the North of the A31 from Guildford to Winchester, and some 5 miles south of the M3 motorway - our nearest exit being Junction 5 for Odiham. 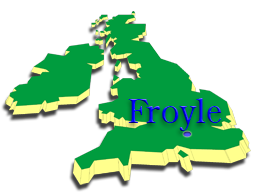 Froyle Promotions publicises the events, organisations & businesses in this village. We also provide links to other web sites that feature Froyle organisations & businesses as well as other sites in Hampshire. NOTE - the Bentley & Binsted links in Links to other sites, Sites in Hampshire has been re-instated. Welcome to Froyle is the welcome pack given to newcomers to the village. In Maps you can find location maps for Froyle, the Village Hall and local footpaths, as well as access to aerial photographs of Upper and Lower Froyle in Virtual Froyle. Bin Collection dates has the EHDC waste collection calendar for Froyle. Events in Froyle is a 12 month rolling event calendar for the village. Alton Citizens Advice Bureau (Local Services ) has a dedicated page. Notices - Shed safe warning - advice from the Police & Fire service about protecting your shed. The Froyle Village Design Statement is now available to view and print. The Froyle Gardening Club has its own pages, with details of Club activities, membership and Show details and results to date. Froyle Fête (Local Organisations) now has its own website. Follow Froyle Village Hall to its dedicated web site. St Marys Church notes will keep you up to date with the Church in Upper Froyle. Froyle Vestments Group takes you to their dedicated website. Footpaths in Froyle describes changes to permissive footpaths and bridleways in the parish of Froyle - information supplied by The Froyle Estate and dated July 7th 2010. Froylcam shows all the pictures we have featured since 2002. The most recent addition is a set of pictures of the Froyle Fête, Flower & Dog Show on Saturday July 14th 2018. Virtual Froyle, under Maps, provides a visual tour of Upper and Lower Froyle using aerial pictures. We provide a web version of the Froyle Village Magazine - currently the April 2019 edition - as well as an archive from 2000. Hedgehog-cam, which records the nocturnal activities in our garden, is currently discontinued (no hogs or badgers!). We now include details of the Parish Council (now on the main menu), local Doctors (Local Services). There is now a link to EHDC's Planning pages. Now that the Village Plan is complete and its recommendations implemented, the Froyle Community Planning link has been removed to avoid confusion. There is a summary of the previous day's local weather recorded at "Adams Field" each morning as well as live current weather from MeteoGroup. Due to excessive spam we have been obliged to suspend the Guest Book.